Providing you the best range of porcheson programmable logic controller with effective & timely delivery. 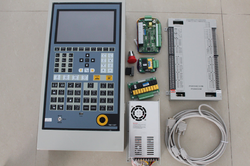 We have established an advanced infrastructure for formulating and supplying our broad and extensive range of Programmable Logic Controller Porcheson in the domestic as well as international market. Our offered logic controllers are highly admired in the market for their optimum performance and rugged construction. These products are manufactured at our well equipped manufacturing unit. Looking for PLC Retrofit ?